The last time I attempted to make chili, it was quite the long and daunting process. There was a crock pot involved, turkey, cayenne, beans…Sounds like a good time, right? Well, I tried to get too fancy. There was also coffee and chocolate. In the chili. Yeah. Although I love those things, very much, I think I love them more when they’re not in my chili. 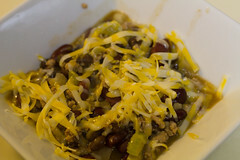 I’ve been thinking about chili again as the weather is starting to get cooler around here. Actually, make that cold! And we needed some cans to make some fancy bread that Nick wanted, so I went and bought some beans. In a large skillet, I sauteed onions and celery in a tiny bit of olive oil. I should have also added a few minced cloves of garlic and some diced bell peppers at this point. Unfortunately, I didn’t have any bell peppers on hand. 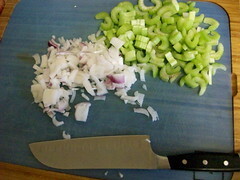 When the onion and celery were just starting to get soft and opaque, I removed them from the skillet and set them aside. 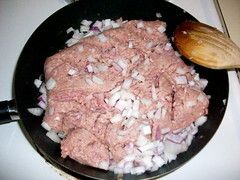 Then I put a pound of ground turkey in the skillet. You’ll notice that there are onions in this photo. I decided that there just weren’t enough onions in the first go-round, so I quickly diced some more and threw them in. When the turkey started to brown, I threw in some cayenne pepper. Unfortunately, I added the cayenne before I drained the fat from the skillet, so a lot of the flavor was lost when I drained the fat. This was my second round of cayenne. Next time, wait to add seasonings until AFTER I drain the skillet. Ok! When the turkey was 99% brown, I added the sauteed veggies back in. 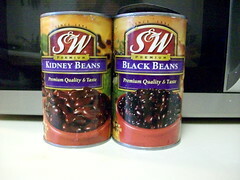 While everything was getting cozy in the skillet, I drained and rinsed a large can of black beans and a large can of kidney beans. I threw those in a large pot and turned the heat to medium-low. I added the turkey mixture to the pot, along with 2 cups of water and 2 teaspoons of Better than Bouillon. Does anyone else see what’s wrong with this picture? There should be 5 times this amount of tomatoes and green onion!! Ok, maybe not 5 times this amount, but a lot more than I actually used. 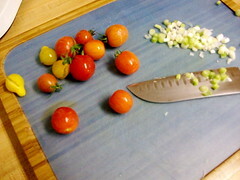 As the contents of the pot started to slowly heat, I diced some green onion and cherry tomatoes. You could use regular tomatoes, or even a can of diced tomatoes. 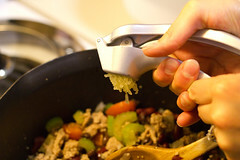 Just be sure that if you use the juice from the can of diced tomatoes that you reduce the amount of water that you add to the beans. When everything was in the pot, I added 1/2 teaspoon of cayenne and 1 teaspoon of chili powder. This was actually the point where I added the garlic, because up until this point, I hadn’t even thought about garlic. You won’t make my mistakes though, right? Then I added a sprinkle of salt and ground black pepper. Oddly enough, when I brought the heat up to medium-high and the chili started to boil, it seemed like the level of broth went waaay up. I even asked Nick if he’d added more water when I wasn’t looking. What happened, in fact, was that as things started heating up, the moisture came out of the beans and veggies and probably even the turkey. So, I just let it simmer uncovered for a bit longer (about 15-20 minutes total) to let the water evaporate. I had to let the chili cool down quite a bit. When it was at an eatable temperature, I grated some colby-jack cheese, and served it up! It was quite yummy, and perfectly hardy. In a large skillet, heat a glob (that would be about 1 tbsp) of olive oil. Add the onion, celery and bell pepper. Heat the vegetables until just soft and opaque, then set aside. 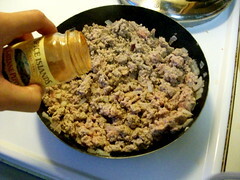 In the warm skillet, add minced garlic and allow it to heat briefly before adding in the ground turkey. When the ground turkey is almost completely brown, add 1/4 tsp of cayenne, then the sauteed vegetables and allow the turkey to finish browning. 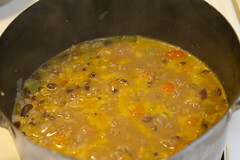 Pour the beans in a large pot, add 2 cups of water and 2 tsps of Better than Bouillon (or 1 cup of water and 1 can of diced tomatoes, or heck, 1 cup of water and 1 cup of vegetable broth. Whichever combination floats your boat). Add the turkey/veggie mix to the pot, along with the tomatoes, green onions, chili powder, the rest of the cayenne, and salt and pepper to taste. 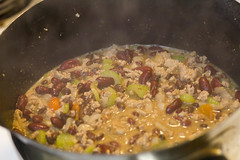 Turn the heat to medium-high and allow everything to come together while it simmers–about 15 minutes. 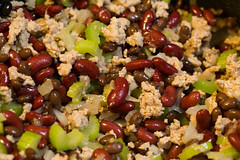 While the chili is cooling off, you can prepare whatever toppings you like. Freshly grated cheese or a dollop of sour cream are always excellent choices. There you go! If you notice any discrepancies with my recipe, please let me know. Like I said earlier, the whole thing was sort of thrown together, so I hope I got it all straight. Hey! I’ve been thinking chili too! I’m making my first one tonight; wish me luck! | Jo In the Kitchen <Liked it! Previous Previous post: Copy Cats and Cheaters? Sort of.